Discussion in 'Traditional Folders and Fixed Blades' started by Paradiggum, Oct 17, 2012. So I've come to the Traditional side of things maybe a year ago. Before that, all I carried was a Spyderco Delica. I started expanding my collection of that kind of knife and then out of nostalgia I bought a peanut. Then I started checking out this traditional forum. Which I must say is one of the friendliest and most welcoming forums I've ever been on. The generosity astounds me. But I digress... From hanging out here it's caused my interest and therefore collection of traditional knives to explode. So I've picked up a few here and there. The first peanut I bought was a black delrin model in SS. Since then I've picked up a yellow peanut in CV. I haven't carried it yet but I'd like to start. I've carried Opinel knives for a while and my Father and Grandfather both carried a #7 for as long as I can remember. I keep mine well oiled but it's not really an EDC. Keeping an EDC coated in oil seems like I'd have oil all over everything in my pockets. So that's not a route I want to go. I guess my question stems from the fact that I handle my knives a lot. My peanut is often unconsciously a worry stone. What I'm wondering is how susceptible is the CV steel to corrosion. I realize it's carbon and will rust if not taken care of. I've search on the forum and I've found threads about forced patina and naturally developed patina but very little about how much attention the steel needs to patina instead of rust. I mean, I can always wipe a blade down but there's not always the ability to put a protective layer of oil or whatever on it. Are the oils in our hands enough to cause corrosion on this steel? I ask not because I'm a newbie to knives. I have many carbon knives that I can keep rust free. 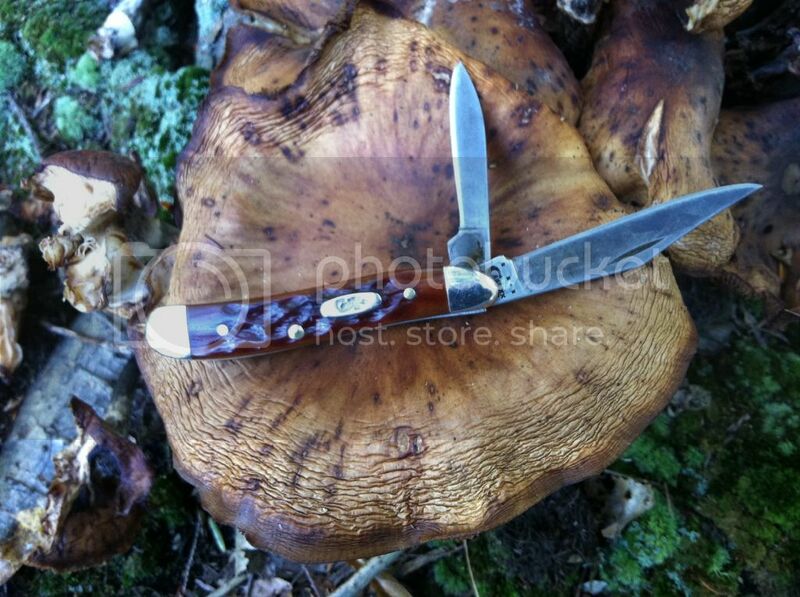 Moras, Opinels and the like. But the fact that these aren't EDC knives that are fondled constantly leads me to be curious and ask. I know many of you may carry a CV knife but not necessarily handle it unless you're using it. If that were the case there wouldn't be an issue. But I realize I have a lot of contact with my EDC because...well I'm a knife nut. And yes, it was hard to write this without saying things like, "handle", "play with" before the word peanut. Because that just sounds wrong. Honestly I think people get a little carried away with the rust subject. Personally my sweat is so corrosive that I can put a nice layer of rust on a carbon blade in the summertime. But I do not let that stop me from carrying my carbon blades. It's just an incentive for me to use it and develop a nice patina on it. As far as oiling the blade in the field I've found that the oil from your forehead or your nose will work in a pinch. I think you'll be fine if you just wipe it down with a rag and some mineral oil at night. I use my EO 85 as a worry stone and it is doing just fine. Cool. that's the kind of thing I'm looking for. I don't have super corrosive sweat. I have a friend that does and if I don't wipe my guitar down after he's done, the strings WILL be dead the next day and feel like razor wire. I don't plan on forcing a patina like I did on my Opinel. Just wondering what others experiences were. Unless it is the weekend, I don't carry any carbon steel knives during the summer as when I sweat through my jeans for a few hours they I can rust up a carbon knife in a day. I don't miss the days of needing to make sure my knife was cleaned at the end of the day. When I was on a crew away from home, I used anything I could to protect the blade (oil from the truck dipstick, brake fluid, white grease tool lube, etc.) during the summer months. BUT.... now it is finally cooling off in South Texas. I will certainly be carrying my old CASE carbon knives. When I don't sweat like a pig, they don't even need nightly maintenance if I haven't cut certain materials with them. I carried them on the job for years, maintenance and all, and they are great working knives and the steel is just fine. Don't worry about the oil issue. You are using it for protection, not to lubricate mechanical parts (except the pivot). Use only enough oil or other protectant to get a sheen on the blade. There is no reason to have any oil from the knife in your pocket. The CASE CV steel is soft enough to sharpen on anything (including sandpaper) and it holds an edge nicely. Although I like other steels more now, I really like having my old carbon blades in my pocket. The CV served many generations or workmen quite well before us, and no doubt will continue to do so. To me, Fall and Spring are great for me as I can change back over to my old carbon steel folders without worrying about them rusting up with normal use and a minimum of care. I havent had a problem with rust on my peanut in the Georgia humidity but if you are worried, put a thin layer of chapstick on your blades and you'll be good. As Carl once said, if there's oil on the blade, you are using too much. A bit on the joints from time to time, when it doesn't open/close like it should, and spread whatever oil is coming out of there on the blades if you want, and wipe them afterwards with a clean cloth. Never had problems with carbon steel knives, and the more you use them, the less rust you'll find on them. The patina will form very quick if you cut a few apples, or any fruits, or meat, potatoes, onions...you know what i mean.. When i didn't use my CV peanut for a long time, just had it in my pocket, and in a humid area sometime, the worst i got was a layer of dust rust, which came of with the first wipe on a cloth with alcohol, leaving the previous patina untouched. Usually, without an encouraged patina, that steel tends to pit a bit, leaving some small points on the mirror finish, which can only add character in my opinion. The thing is. just go ahead and use that knife, without worries, and in no time you'll know what and how much it needs to be taken care of. Most of the time, if not all, a little wipe on the blades is all that is needed. One more thing i've noticed, is if you want to build/encourage a patina, at the beginning or until you are happy with it, if you use mineral oil after every few apples or fruits, that patina will get thicker and more consistent. You should be fine, I've never had a carbon blade rust, I have worked in wet & hot and humid environments no issues. Many man have worked on water and lived in the wilderness with carbon knives. All my knives have patinas, I think rust is more of a issue if you are trying to preserve a shiny blade. If you are worried about it maybe use it at home in a controlled environment, cut up some fruit, cut your steak etc. and let the patina naturally form before bringing it to work. At work if you are handling it or using it give it a wipe on your pants, shirt sleeve, handkerchief before putting it away. I carry a peanut everyday along with another knife, nowadays the peanut gets used the most, I keep it clean so it gets washed often with dishsoap & water, after I dry my knife I add a few drops of mineral oil to the pivots, and rub a little on the bone, there is enough run off to smooth over the blades with a thin coat, but after a decent patina I'm more concerned with the pivots rather than the blades. I use my peanut fishing, it's become my favorite fishing knife trimming lines not a overkill, cleaned plenty of fish, and cleaned my knife off in the lake until I could get home and give it a proper cleaning. Use it enjoy it and don't stress or worry. Hope my rambling was of some help. That works great too, i do that sometime by very lightly dragging the edge of the blades in the chapstick, and then spread the tiny amounts left on the edge to the whole blade with my fingers. Less is better, just enough to see it shining. I've never seen a knife rust in one day. I've pocket carried carbon steel knives on the Chesapeake Bay in mid summer, shorts damp with salt water that dripped from the crab pots, and that night I just wiped the knife down and it was fine. The Bay is a very large body of salt water. When I was a kid, all the old timers had carbon steel knives because they didn't trust the new stuff. The bait bucket on granddads boat was an old tin bucket with several old carbon steel butcher knives in it. These knives were used to cut the salted bull lips or salted eel that was used for crab bait. At the end of the day, when the boat was hosed off, the knives were hosed off and dropped back in the bucket point down. They were black as the Earl Of Hell's riding boots, but they were not rusty. lak and a little pitted, but they cut well. It was my job as a kid to sharpen them up on the big od dished in 'carborundum' stone on the work table. I actually didn't have my first stainless steel pocket knife until I joined the army. I got one of those MLK issue knives from the supply room, and it was just okay. I didn't like it so switched to the Camillus TL-29 they had lots of. This was a carbon steel knife, and it was great. It was what I was used to. We used the issue knives in some humid places with no trouble. I think most people exaggerate the fear of rust and maintenance in their own minds. Nothing bad is going to happen in the course of a day that will hurt a carbon steel knife. Just let it go and use the heck out of it. If your living in a salty environment then maybe force a patina like the old timers did. I remember my granddad sticking his new knife in a potato over night to put a protective patina on his knife before going out on the boat. Go ahead and let the blade darken as much as it likes. Don't smear oil on the blade or anything else. This just has pocket lint sticking all over it. JUst wipe it down with a dry bandana or rag that night. If you do oil the blade, just put a minuscule drop of oil on your index finger tip. I mean minuscule. Then rub your thumb and index finger together, then just wipe down the blade between your fingers and leave it. You only need the most micro thin bit of oil. Carry and use the the knife. That alone will go a long way to keeping the knife well. They like to be used. Thanks for the replies. I figured it was probably more overblown than reality. I haven't seen it a lot on this forum but a couple of other forums where some modern makers are using carbon steel here and there, I've seen some users complain about rust. I've used the chap stick trick for a long time on my Opinel and Mora. One of the reasons I'd rather not keep applying something to the blade is because of how often it's handled. I'd rather not have whatever substance that's protecting my blade all over my hands. Or constantly being wiped off my blade where I have to remember to reapply due to mindless handling. Moisture (water) won't make a blade rust as fast as other corrosives will, like salts, acids, etc. Those are the things to watch out for, with carbon steel. Something like vinegar, by itself or also in mustard, pickle juice or salad dressings, can fully rust a blade's surface in a couple hours, if the blade is neglected for that time. Finger/skin oils contain salts (from sweat), so I wipe my carbon-bladed knives down every evening with Windex or isopropyl alcohol, both of which are excellent at stripping away the oils from the blade. I started doing that, when I found some rust-colored 'fingerprints' on one of mine. If the blade is just rinsed and/or wiped down after each use with a dry & clean paper towel, that's usually enough to keep rust at bay during the day. For my knives in non-stainless steels I just wipe the blade off when I'm done and put it away. Depending on what I was doing I might rinse it off with some water and then dry it off. They develop a patina with use and then they're practically maintenance free once they have a good patina. On my EDC blades are about 85% carbon steel. So I carry tthese blades very often. I´ve never had any problems with rust. I don´t keep them oiled in any case; just if I store a knife away for some time, I add a very thin oil film on the blades. But during pocket carry, I don´t let the blades oiled in any way (I don´t like that, too). Ok, back to my EDC blades - I don´t let them oiled in my pockets and had never any problem with rust. One thing I should add - I don´t remove patina, which protects the blade. Knarfeng once told about the difference between rust and patina (something chemical). After using an EDC carbon steel blade for food prep or any wet/humid work, I only clean the blade with water (or soap, if any fatty products were cut) and make sure, that the blade is kept dry after that procedere. I´ve never put a wet knife in my pocket or the drawer. Imo sweat doesn´t damage the carbon steel with rust. I felt the same way at first, but decided as an experiment to carry a carbon opinel. I had it with me when I went to my niece's 5th birthday party, a very busy day for me and my knives. I used it to cut up some food for my niece and opened all of her presents because I'm the one that always has a pocket knife. I handled it a lot and all I did was wipe it off after I used it on food. At the end of the day, there wasn't any rust. I should mention, I had a good patina on the blade but that was it. I do plan on letting the patina build and have no intention of removing it. I'd just rather not force one prematurely. I've done that with an Opinel. I'd rather it show what it's done over time. Kind of a history of the knife. I've always intended to wipe it down and all of that maintenance after using it for something. My biggest worry was how susceptible it is to corrosion due to the high amount of handling my EDC gets. When I use a knife for something, I will always wipe it down. The absent minded handling in or out of pocket can be something I do without even thinking of it. I just wanted to make sure that handling isn't enough to cause issues. I've seen Opinels with finger prints on them from lack of attention after handling. (Not mine) So I was wondering how the CV fares. Andi... I think I got you!!! that answer is from another thread, isn't It?? ?